St. Louis Cardinals baseball is back on TV tomorrow (Saturday, March 5) when the Cardinals take on the Miami Marlins on FOX Sports Midwest. The telecast starts at 12 p.m. CT from Jupiter, Fla.
FOX Sports Midwest also televises Sunday’s Cardinals game vs. the Washington Nationals and Monday’s against the New York Mets. Dan McLaughlin (play-by-play) and Al Hrabosky (analyst) call the first three spring training telecasts. Former All-Star Jim Edmonds makes his debut in the broadcast booth Wednesday, as the analyst alongside McLaughlin for Marlins-Cardinals. 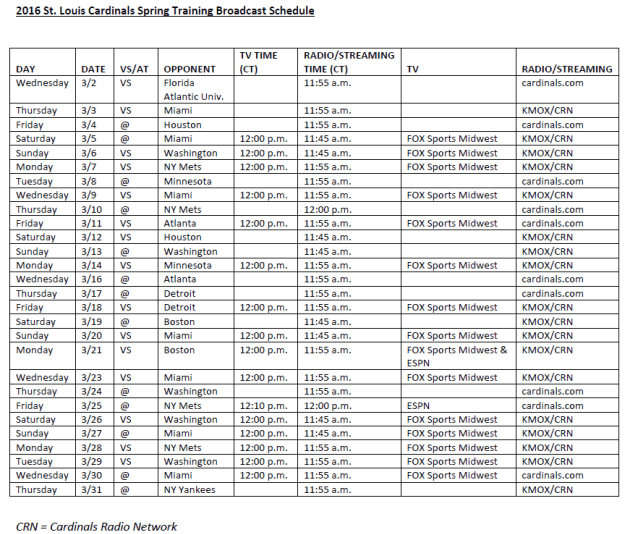 FOX Sports Midwest will televise 15 Cardinals spring training games in March. Cardinals offseason programming on FOX Sports Midwest is presented by the Mid-America Chevy Dealers.